Sold. 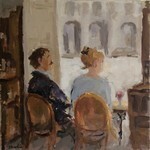 Couple enjoying Paris. At Ma Bourgogne, Places des Vosges. Sold. Café La Palette in Paris. Sold. Autumn in Paris. Couple at Place des Vosges. Sold. Late night visitors of Café de Flore in Paris. Sold.Young girl reading at Place des Vosges in Paris. A favorite student spot.